I was at the New Amsterdam Market recently (Welcome back folks!) and besides indulging in lots of obscure apples and ridiculously expensive Vermont Maple Syrup that I've been finding excuses to put on just about everything, I also found a vendor selling Turmeric Tonic. He used actual fresh turmeric. I'm so fortunate that besides living near New York City's biggest farmers' market, I also live near Kalustyans, where you can find every herb, spice, bean or grain you'd ever want to cook with, and sure enough, they had fresh turmeric. I went home and made this lovely drink using the ginger, turmeric, cayenne pepper, some honey and a little apple juice. Ginger, turmeric and cayenne all act as anti-inflammatory agents. In Aruyveda practices, ginger is also used to stimulate circulation, help with digestion and fight off infections. It helps with nausea, helps ward off colds and is great for menstrual cramps. 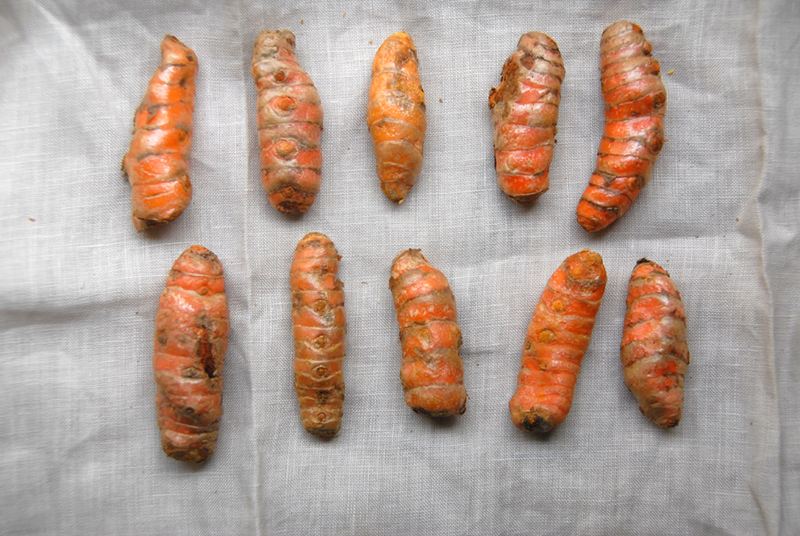 Turmeric, which contains circumin, is an antioxidant and good for arthritis and healing wounds. In Chinese medicine it is used as a treatment for depression. Cayenne helps to clear congestion and helps boost immunity. Drink this ginger turmeric tonic chilled or at room temperature. It will last for about 5 days. If you're like me, and don't have a juicer, just use your blender. You'll have a few pieces of chopped turmeric and ginger in it, and there's nothing wrong with that. Blend the ginger and turmeric in the blender. Add the lemon, lime, honey, cayenne, water, and apple juice and blend to mix.